Select Sires’ daughter-proven lineup offers customer-owners a diverse selection of genetics while focusing on balanced sires with profitable health and wellness traits and favorable fertility values. 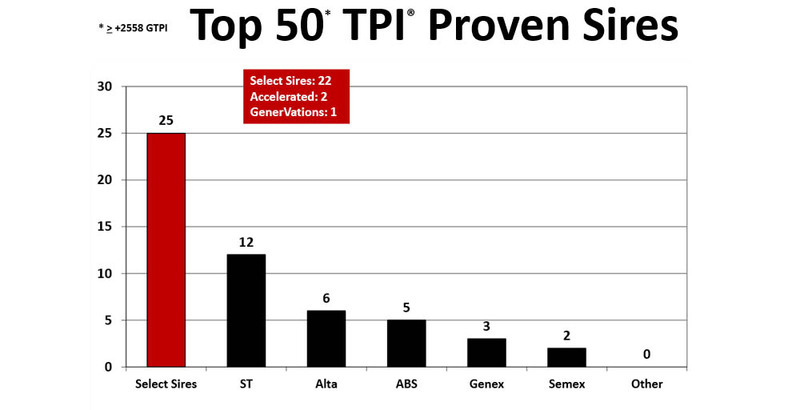 With more than 25 of the top 50 sires on Holstein Association USA’s Top TPI® Bulls list, Select Sires exhibited incomparable strength. Furthermore, Select Sires is home to 41 sires with GTPI values +2508 or greater, twice as many as the cooperative’s closest competitor. Among these industry leaders are 250HO13267 DUKE (+2752 GTPI) at No. 6, 7HO12421 MILLINGTON (+2697) at No.8 and 7HO12659 PASSAT (+2695) at No. 9.